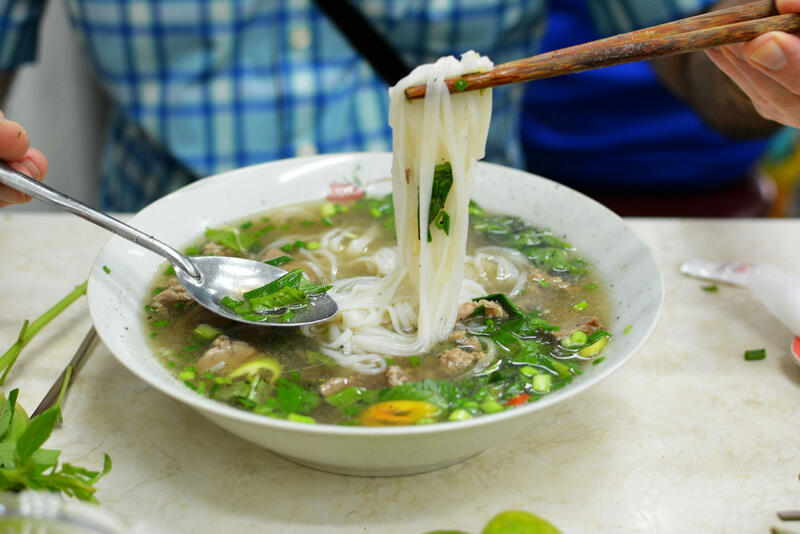 A bowl of pho, a beef and noodle soup, served in Ho Chi Minh City, formerly Saigon. Pho has a rich role in Vietnamese, Vietnamese-American, and now, American culture. I fell for pho in Saigon in 1974, when I was 5 years old. When my family came to America in 1975, my mom satisfied our family's cravings for the aromatic beef noodle soup with homemade batches, served on Sundays after morning Mass. As Vietnamese expatriates, we savored pho as a very special food, a gateway to our cultural roots. When we didn't have pho at home, we went out for it in Orange County, California's Little Saigon, patronizing mom-and-pop shops that welcomed us with the perfume of pho broth. Nowadays, there are many more pho options beyond the Vietnamese communities, and I love to check them out whenever possible. From the cooks in the kitchen to the servers and customers in the dining room, more non-Vietnamese people are getting into the pho scene. As a cookbook author and cooking teacher, I also know firsthand that a multicultural mix of home cooks across America is interested in making pho. Much of the anger centered around the choice of a white person to authoritatively speak about an Asian food. As the chef shared his personal insights, he never mentioned his fondness for the soup, his personal connections to it. That omission was an editorial mistake. Treating pho as merely a fashionable food negated its rich role in Vietnamese, Vietnamese-American, and now, American culture. Pho has always been unpretentious and democratic, inviting everyone to experience and appreciate it. However, pho also represents the history of Vietnam and its push for self-determination. Born during the French colonial period, this dish persisted through political upheaval and economic hardship, then resettled and flourished with Vietnamese immigrants all over the globe. Pho has a story that's much longer than a noodle strand. The noodle soup was created at the beginning of the 20th century as genius make-do cooking. French colonials in Vietnam ordered the slaughtering of cows for the steaks they craved. The bones and tough cuts were left to local cooks, who were used to cows as draft animals but soon found a way to turn the leftovers into delicious broth with rice noodles and thinly sliced meat. It was sold as affordable street food that vendors customized for each diner. Pho fans came from all backgrounds, as the soup's popularity spread — from Hanoi in the north to Saigon (now Ho Chi Minh City) in the south. Inspiring cooks and even poets, it became Vietnam's national food. Vietnamese people are nationalistic, and pho is not only part of their cuisine but also their pride. Yes, it was the French who made beef scraps available, and yes, many of the initial pho cooks were Chinese, but the noodle soup was created in Vietnam. The Vietnamese people made the best of their circumstances and turned the situation into something of their own. No one may claim pho but the Vietnamese, whom, as history has proven, are a feisty bunch. We'll never know how aware the critics who took Bon Appétit to task were of pho's history and meaning. As a Vietnamese-American, I wasn't angered that the chef featured in the video was white; I'm glad that this soup that forms such a rich part of my cultural identity is gaining new fans, and I welcome all into the kitchen to cook it. But, for an authoritative lesson on pho, which is what this video purported to be, why not tap one of the many Vietnamese-American mom-and-pop shops that have long kept this traditional soup simmering around the country? Or, how about letting a Vietnamese-American chef compare notes with the non-Asian chef? At Mic, a news site with a millennial audience, the controversy was framed as "Columbusing" — a word that describes when white people "discover" something that has been around for years, or even centuries. The term was new to me, but the concept was not. For years, some people conjectured that pho had strong French roots because it resembled feu ("fire" in French), as in pot-au-feu, the boiled beef dinner. The noodle soup's name most likely evolved from the Vietnamese pronunciation of fen, the Chinese term for flat rice noodles. In applying the Columbus metaphor, Mic signaled that pho had truly become part of America's multicultural table. It had become a vehicle for having a difficult, important conversation about race. This controversy will likely dissipate, like so many things on the Internet. But if there's anything to be learned from the video fiasco, it's this: Food can — and should — be a way for us to foster deeper understanding of one another. Andrea Nguyen is a teacher, consultant and author of the forthcoming work The Pho Cookbook.